This row of ancient buildings has been looking over the city of Pittsburgh for well over 100 years, and each owner through time has had their way with each facade. On a bright sunny summer day they stood unapologetic for crumbling insul-brick siding, replacement windows that didn’t fit the original opening, and grass growing where a sidewalk had been. On a perfect summer day, everything is perfect. I appreciated the choice of colors and the distinction each building still held, how solid still after a century, wondering what stories they could tell of the span of human from the beginning of the industrial era to today. 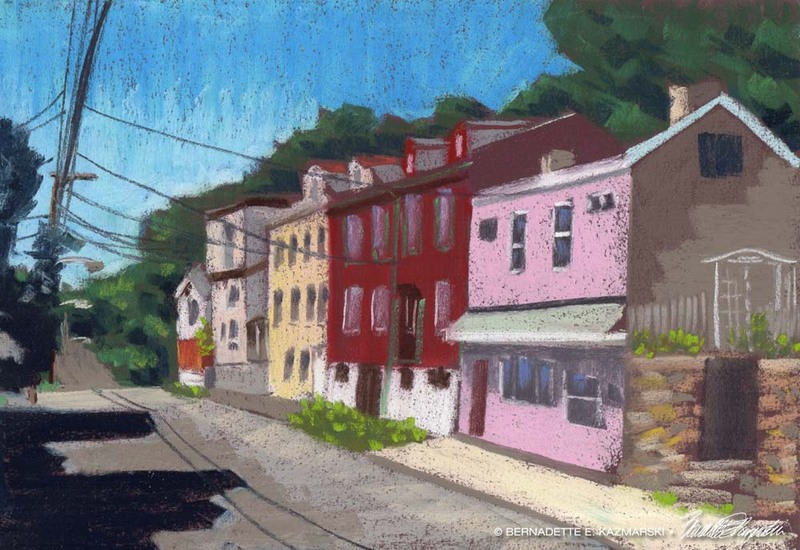 Facades, North Side Pittsburgh, Pastel, 10.5 x 15, 2018. The original is not framed yet but will be. Digital, giclee and canvas prints as well as greeting cards are available. This is my painting from Day 22. See other paintings in this and other painting challenges on the page Creative Challenges.